This was so good I could have eaten it with a spoon! And easy, good grief. After I pitted the cherries and diced them up it came together in minutes. I used the juice from the diced cherries to add into the dip, it gave it a little more cherry flavor. The sour cream gives the dip a very light texture and clean feel in your mouth. I loved it. I can’t wait to try this with other fruit. Any juicy, ripe fruit would be fantastic in the dip. I can’t wait to try peaches. Just imagine fresh ripe peaches and their juice in a light, delicious fruit dip. I can’t wait for peach season. I used vanilla wafer cookies to accompany the dip but you could also use sliced fruit such as bananas, orange segments or apples. 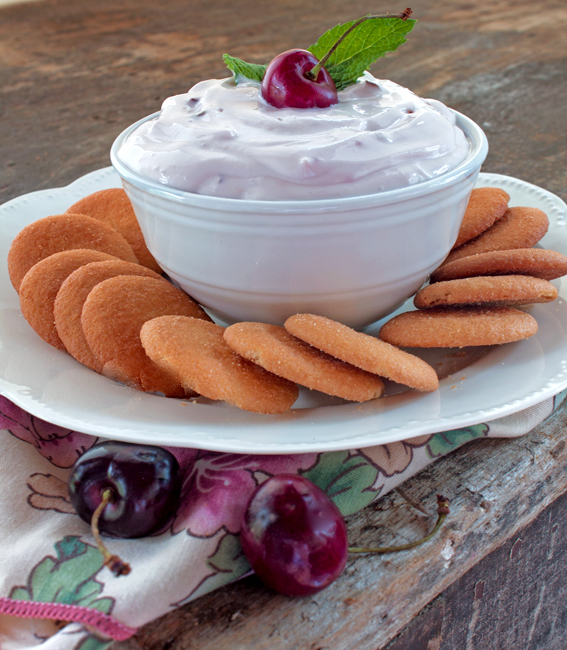 Sweet Cherry Fruit Dip is delicious and perfect served as an appetizer or snack. It would be perfect to take to a pot luck or to work as a snack for coworkers. Whether it’s summer picnics or winter holidays, they’ll love you for bringing this little treat! Enjoy! Place the sour cream in a medium size bowl. Add the brown sugar and whisk until well incorporated. Add the diced sweet cherries and any juice from dicing the cherries. Stir the cherries into the sour cream. Keep cold in the refrigerator until ready to use. Serve with cut up fresh fruit or cookies.